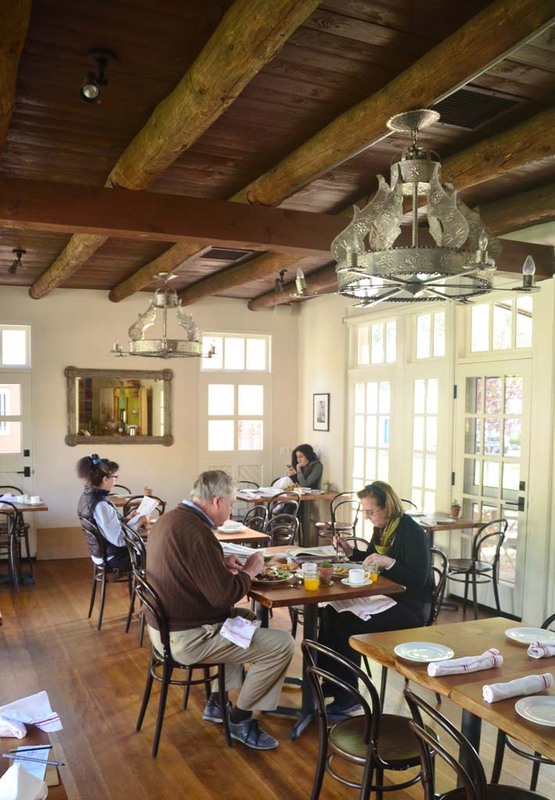 The dining room at Los Poblanos, illuminated by a chandelier fashioned by tinsmith Robert Woodman, is a favorite with both guests and locals. The cuisine of executive chef and native New Mexican Jonathan Perno has won awards, including being listed as one of Bon Appétit magazine’s Top 10 Food Lover’s Hotels. 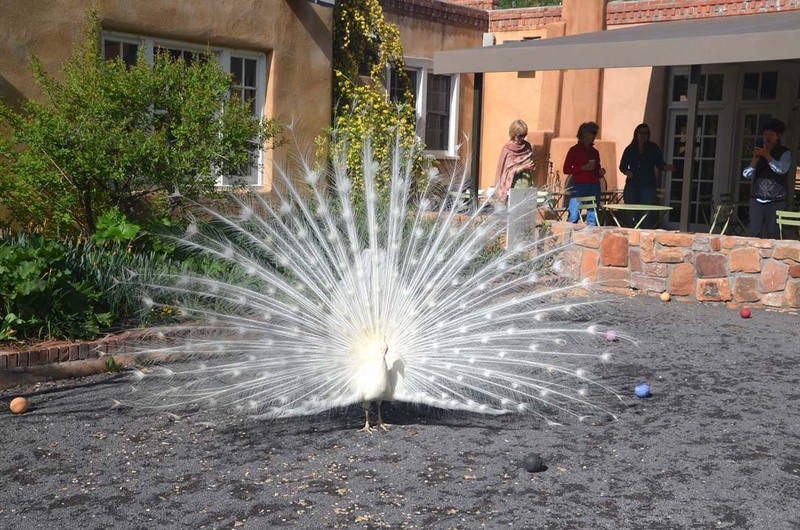 La Quinta Cultural Center, on the grounds of Los Poblanos Inn, provides space for cultural, civic and social events. It was designed by Southwest architect John Gaw Meem, known as the “Father of Santa Fe style.” Los Poblanos is said to be a model for agritourism. 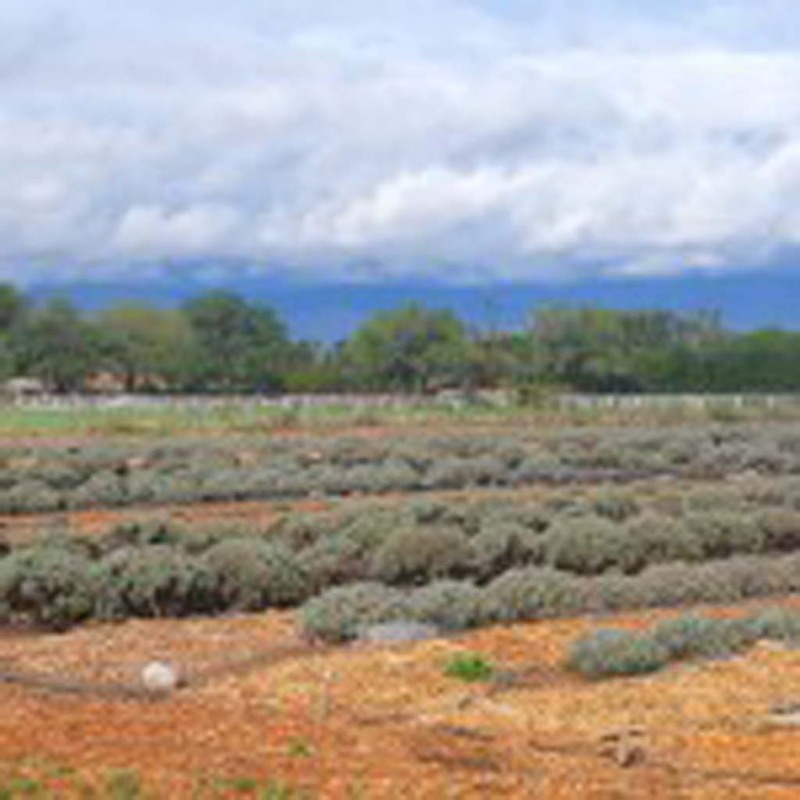 Land that was originally inhabited by Anasazi (ancient Pueblo Indians) now serves as lavender fields at Los Poblanos Inn and Organic Farm. The fields were first planted in 1999, and visitors can find products from these fields in the gift shop. 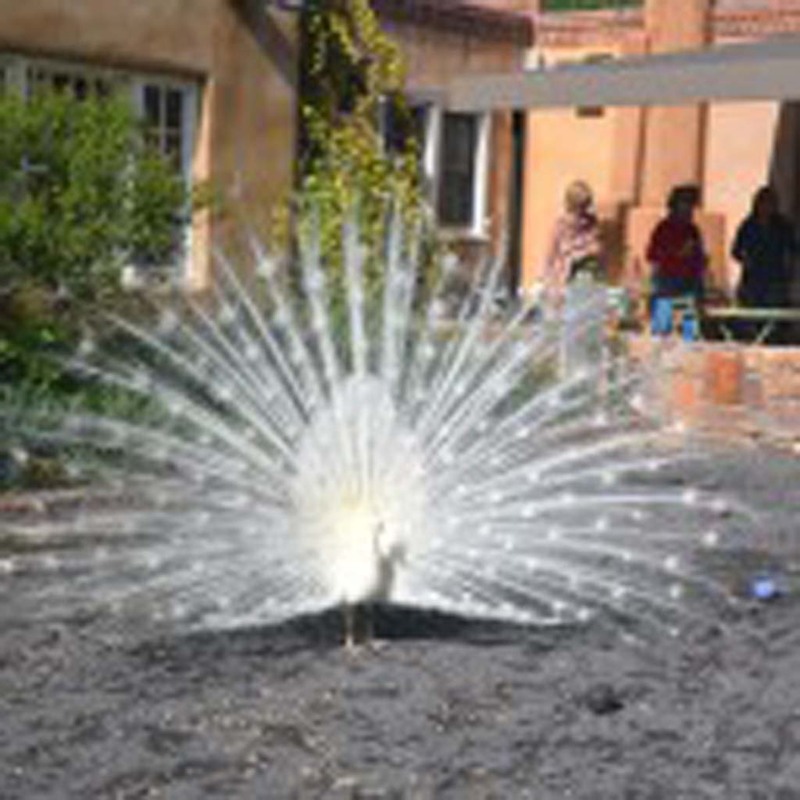 One of four peacocks that lives at Los Poblanos and the only all-white one, this bird likes showing off for guests. 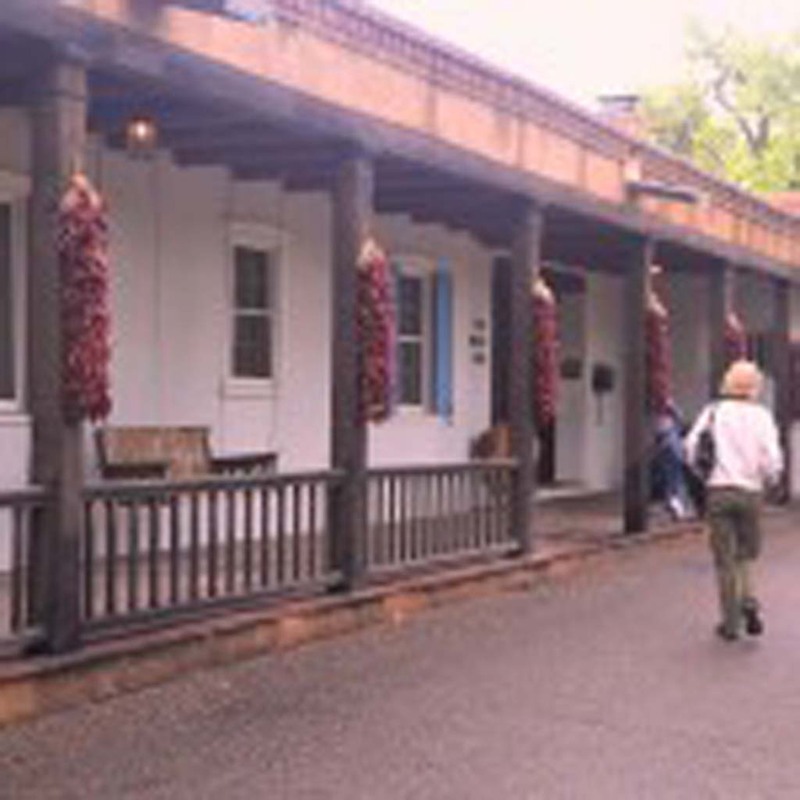 Ristras, New Mexico’s iconic strings of drying chili pepper pods, grace the office/ranch house at Los Poblanos Inn and Organic Farm. I haven’t a clue, but it’s on the breakfast menu at Los Poblanos Historic Inn and Organic Farm and I’m game. Thanks to my cell phone and Google, I learn that shakshuka is a popular Moroccan breakfast dish of poached eggs that float in a spicy tomato sauce, garnished with bacon and feta cheese. And here at Los Poblanos, it is accompanied, much to my delight, by gluten-free cornbread. My husband, Jerry, deliberately slows as he drives down the long entry road that runs through the dense arches of cottonwood trees. 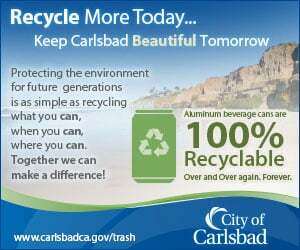 It doesn’t take long, however, to know that this is where we want to be. 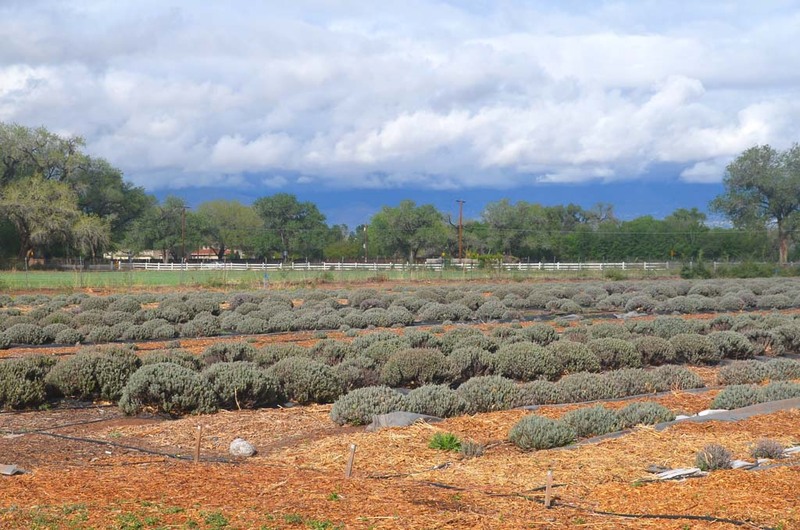 Los Poblanos, a boutique hotel and lavender farm, sits within the boundaries of Los Ranchos de Albuquerque, a village of almost 7,000 just seven miles from downtown Albuquerque. The inn could be a day away for all we know. That’s because residents of Los Ranchos, a 4.4-square-mile town sitting just east of the Rio Grande, incorporated in 1958 with the goals of maintaining the area’s rural flavor and creating a unique identity. For those who live in the Albuquerque metro area, Los Poblanos is a place to get away without having to go far. For the rest of us, it’s just a beautiful place to get away. The original boundaries of the ranch once stretched all the way to the crest of the Sandia Mountains, but today, Los Poblanos Inn occupies 25 acres. In the 1930s, the ranch’s first owners hired notable craftsman, professionals and artists to create what we see today. John Gaw Meem, considered New Mexico’s finest 20th-century architect, designed and remodeled the ranch house and the large communal building called La Quinta. Today, La Quinta still serves as a gathering place for social, civic and cultural events. 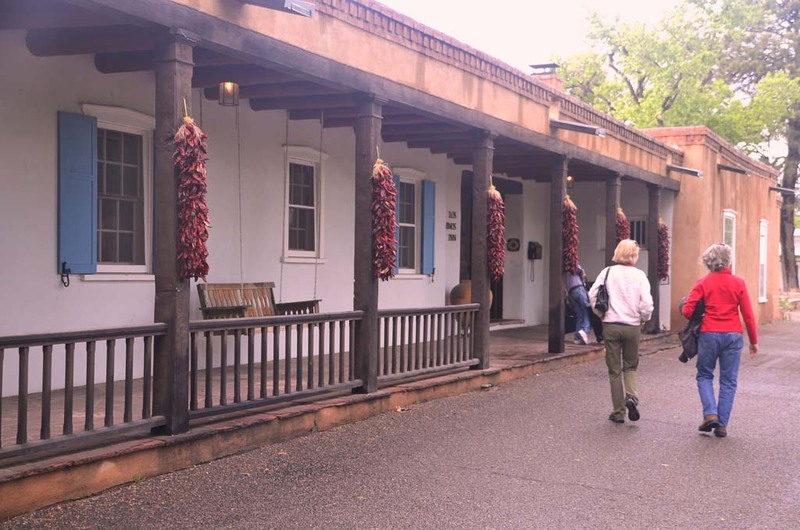 A Spanish courtyard is but one of many quiet spaces at Los Poblanos Historic Inn and Organic Farm in Los Ranchos de Albuquerque, a village of 7,000 just a few minutes from downtown Albuquerque. The farm’s 25 acres is part of a family property that once stretched to the Sandia Mountains. Los Poblanos means “people of the pueblos,” the adobe-style communities of New Mexico’s native populations. Tinsmith Robert Woodman fashioned the light fixtures illuminating the buildings; ironsmith Walter Gilbert crafted the iron door handles depicting San Ysidro (the patron saint of farmers and laborers); artist Gustave Baumann carved the floral and Native American designs into the oversized pine doors and other designs over the mantle in the formal ballroom; and landscape architect Rose Greely designed the formal Spanish-style gardens where visitors can meander or pause to contemplate life and the land. 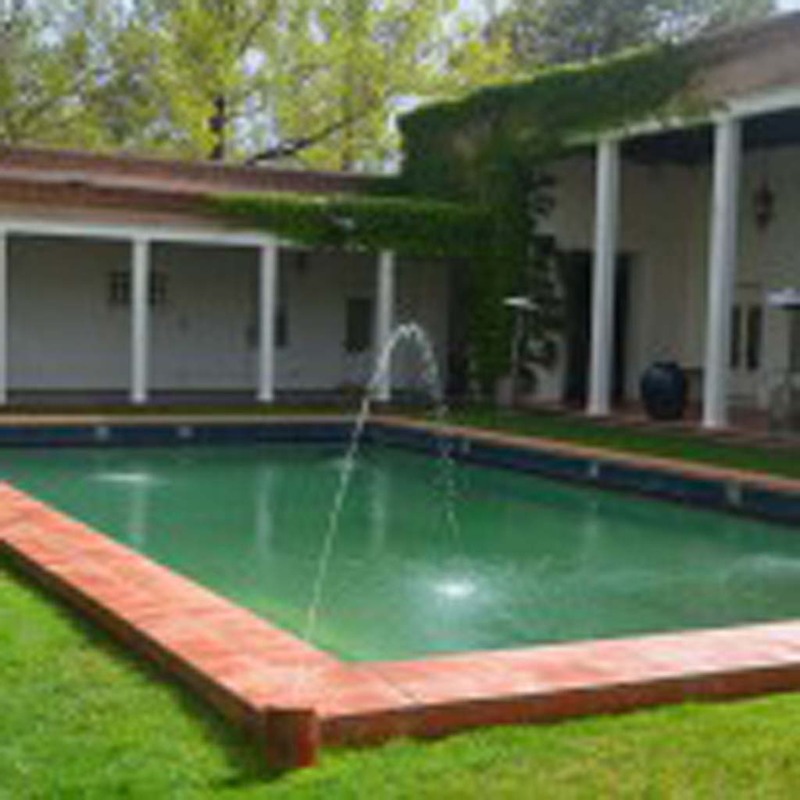 Los Poblanos presents a complete package of history, tranquility, setting, comfort and cuisine. 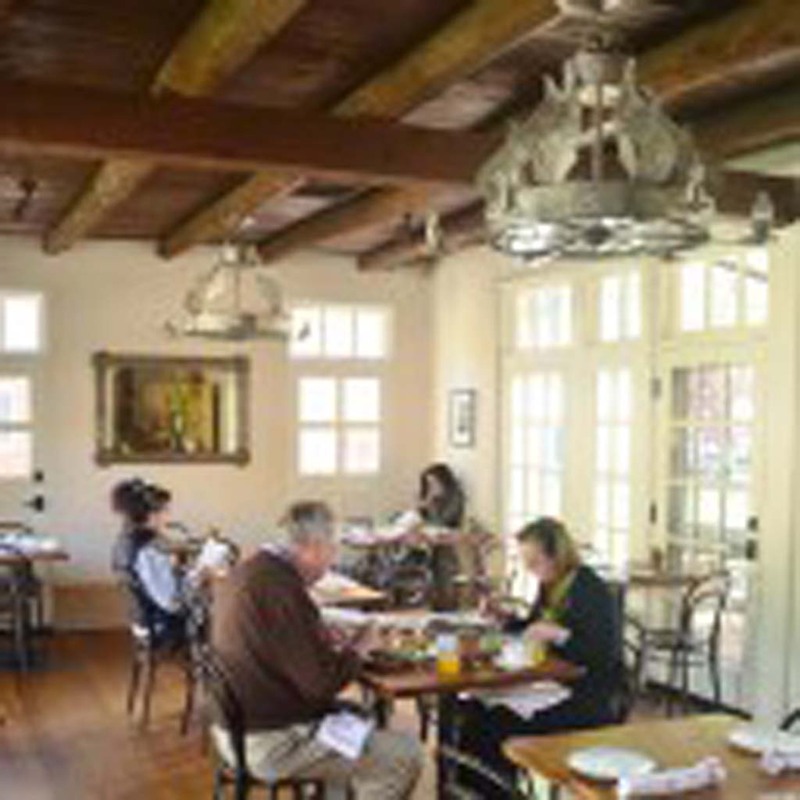 Diners enjoy Perno’s culinary creations in a warm and rustic farmhouse dining room softly illuminated by Robert Woodman chandeliers of tin. Los Poblanos owner Matt Rembe has created a whole that is greater than the sum of its parts; the farm is a poster child for agritourism. Guest houses provide all the modern amenities within a charming, uncluttered environment. The family’s other enterprises include wholesale production, retail sales (a gift shop features many items made on the farm), the restaurant and catering and venues for large and small events. 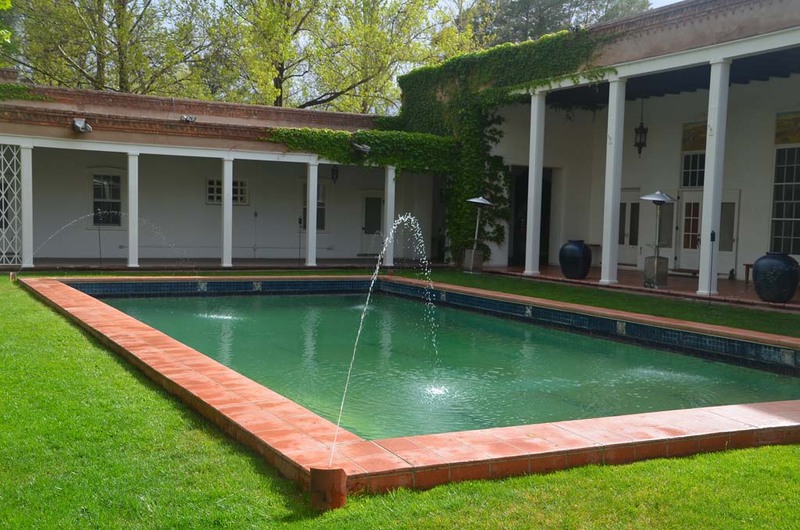 The formal gardens, designed by landscape architect Rose Greely, invite visitors at Los Poblanos Inn to meander or linger a while. The boutique hotel offers 20 rooms – clean, simple and modern with an authentic farm feel. Wood-burning fireplaces and original artwork transform the rooms into cozy retreats. After enjoying our Moroccan breakfast, we stroll to the lavender fields, which are warming in the April sun. The air is comfortably crisp and the Sandia Mountains are dusted with snow from a storm that blew through yesterday. This reminds us that Albuquerque is more than a mile high. Farm workers are arriving and the place is beginning to hum, but at least one resident is staying lazy. A large, snow-white peacock struts across the bocce ball court, spreading his feathers as if to brag that he, unlike we who are only passing through, does not have to leave — ever.